- In this film I was interested in making places that were far apart in physical distance appear next to each other in cinematic time. Each shot is an independent scene from a separate location and I animated objects and materials found in these places. The optical soundtrack is mixed low, so that the sound of the static electricity on the track mixes with the recorded soundtrack. 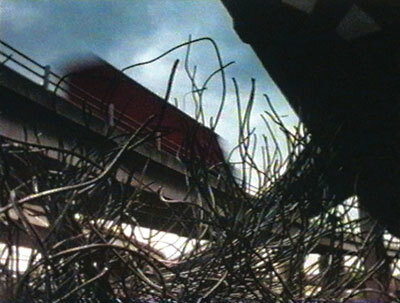 In Static, Hansen uses her startling animation techniques on a panoramic scale. In a series of elegaic tableaux, ranging from motorway flyovers in San Francisco to boggy Norwegian moorland, items spontaneously twitch and disintegrate; these artefacts remind us of the ephemerality of the human condition as they are returned to the elemental forces of the landscape. A stunning piece of work.